1. To make the compote, gently heat the fruit, sugar, cinnamon and 50ml water in a pan, stirring occasionally, for 5 minutes until the fruits have defrosted, released their juices and softened but still hold their shape. Add the dissolved cornflour and continue to cook for 1 minute, stirring constantly. It will be quite thick and jammy. Remove from the heat and leave to cool completely. 2. Meanwhile, make the custard. Put the custard powder in a large jug. Stir in a little milk to make a paste, then put the remaining milk and condensed milk into a non-stick saucepan. Bring almost to the boil, stirring. Remove from the heat and gradually pour into the custard paste, stirring until combined. Return to the pan and gently heat, stirring constantly, until quite thick. Remove from the heat, stir in 100ml advocaat, then cover the top of the custard with cling film to prevent a skin from forming. Allow to cool. 3. While everything is cooling, halve the madeleines lengthways and sandwich back together with a little of the conserve. Cut each sandwiched madeleine in half widthways. 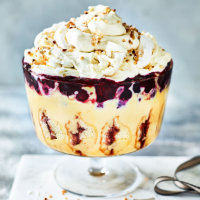 Arrange the halves in a small trifle bowl (about 1.2 litre) to cover the base, then drizzle with the remaining 50ml advocaat. 4. When the custard is almost cold, spoon it over the madeleines and level with the back of a spoon. Top with the berry compote, level again and chill for 3-4 hours or until ready to serve. 5. Up to 2 hours before serving, whisk the cream and mixed spice in a bowl to soft peaks, then fold in nearly all the meringue. Use to top the trifle, then scatter with the hazelnuts and remaining meringue pieces. Serve immediately or chill until needed. TIP: This trifle will keep for 2 days in the fridge, without the cream layer. Just top with the meringue cream up to 1-2 hours before serving.